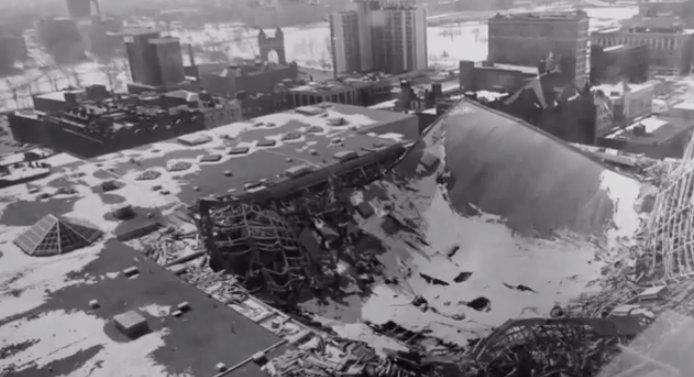 The collapse of the Hartford Civic Center roof in January 1978. For many years, Ralph Nader has pushed the idea of an American Museum of Tort History which would be located somewhere in Connecticut, probably Winsted. The exhibits would concern tort cases from all over the U.S. but you have to think the Hartford Civic Center roof collapse would merit a special diorama. It's been 36 years since the roof caved in on January 18, 1978 at 4:15 am. It dropped about 83 feet toward the floor where hours before thousands of people had watched a college basketball game. Nobody was in there, nobody got hurt. But, had the collapse come when the arena was full, it probably would have been the worst disaster in American history, with a greater loss of life than 9/11. The collapse was initially thought to result from the weight of accumulated snow and ice, but investigation revealed a serious flaw in the design and construction, along with warning signs that didn't receive the proper attention. This hour, we talk to two of the state's leading civil engineers along with two reporters who covered the collapse from those early moments to the political finger-pointing that tarnished the career of Hartford's mayor. Howard Epstein is a professor in the Department of Civil and Environmental Engineering at the University of Connecticut, and is a registered professional structural engineer. The first time you laid eyes on it, the sheer size tended to rip your vocabulary away from you. It was so damn big -- 2.4 acres! -- and the bulk of it just sagged into the middle, right on top of the space that you knew was designed for thousands of people to sit in.